Geri Ferrara became editor of The Dominion Post in 2003, bringing with her more than 20 years experience in the community newspaper field. Ferrara was trained in Gannett’s News 2000 community newspaper program. The corporate-wide Gannett initiative trained editorial departments to understand the value of local news coverage, diversity, reader outreach and interaction, and the principles of First Amendment journalism. She later became a program facilitator. Ferrara graduated from “Gannett University,” and was promoted to her first post as a weekly newspaper editor. She eventually oversaw the operation of five Atlantic County weekly newspapers before returning to The Daily Journal, an 18,000 circulation six-day paper, as assistant city editor. During the course of her career, she served the Daily as city editor, editorial page editor, special projects editor and a managing editor. 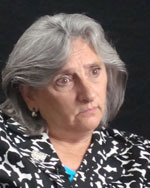 In 2001, Ferrara took early retirement to partner in the acquisition of a weekly newspaper, The Island Journal, in Brigantine Beach, N.J., where she served as vice president, editor and publisher. Geri Ferrara, editor, The Dominion Post, says the main goal for her newspaper is “holding government’s feet to the fire” and “empowering the citizens” of her community. Geri Ferrara, editor, The Dominion Post, says she wants a copy of “the honor role, with Johnny’s name highlighted, hanging on the refrigerator” as much as she wants the City Council to read The Dominion Post and solve the problems it reports.